The authors photographed a Village Weaver in Abu Simbel, Egypt, on 1 May 2006, being the first record of the species in Egypt. There were no indications of it being an escaped aviary bird. This record is published for the first time, although it was accepted in 2011 (see here). There are many breeding colonies of Village Weaver in Khartoum and several of these have been submitted as PHOWN records, see here. 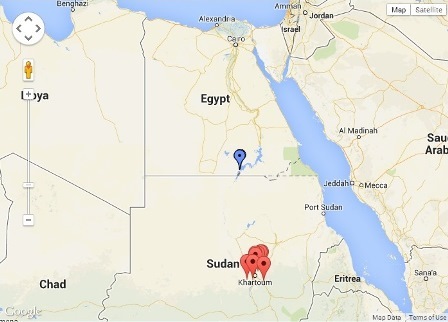 Village Weavers have been recorded up to 100 km north of Khartoum, along the Nile River, by Tom Jenner (pers comm in this paper) - this record is less than 700 km south of Abu Simbel, but the intervening area has not been searched yet. Published maps show the Village Weaver as occurring south of Khartoum along the Nile (see Weaver Wednesday). The red markers on the map show the PHOWN records around Khartoum and the blue marker shows the new sighting in Abu Simbel, Egypt.